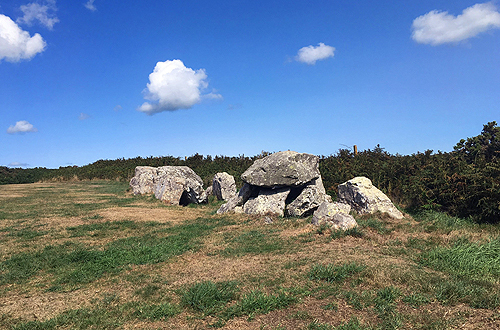 The Allée Couverte de Vauville, also known as the Pierres Pouquelées is a passage grave to the northwest of the town of Vauville on the Cap de la Hague in the Manche. The Allée Couverte can be reached by a longish and steep walk up from Vauville, or you can drive almost right to it by following the road down from the north, and then following the unmade tracks from there. 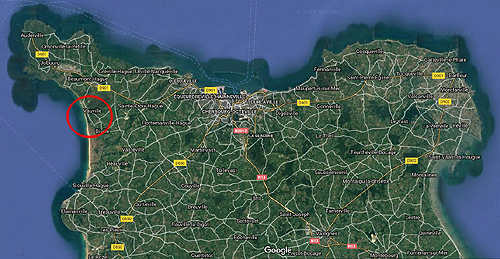 It is in a great location overlooking the sea, with the rocky cliffs of Cap de la Hague stretching away to the northwest, and the long beach running south from Vauville. 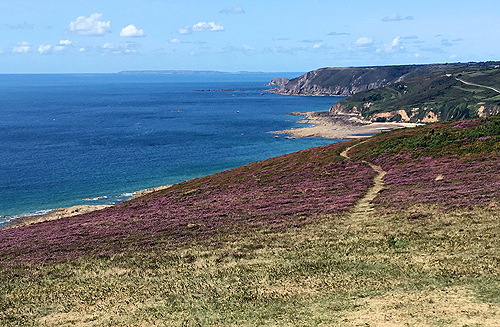 There are some circular routes if you want to take in the cliffs and beaches on this dramatic coast where race between the mainland and Alderney can be seen in full flow out in the sea. The Allée Couverte is aligned on about 150°, North West | south east and runs slightly downhill with a large perpendicular end stone still in place at the higher end. 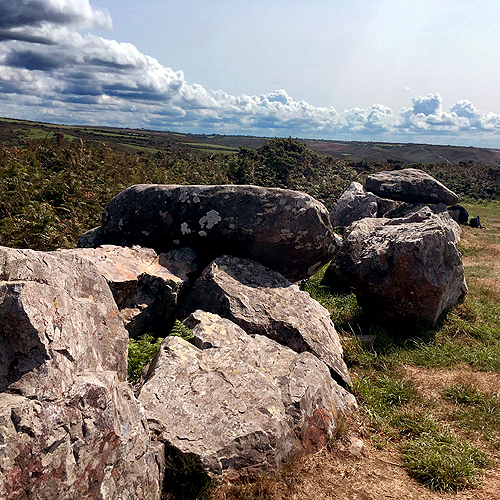 The remains are about 12 metres in length but perhaps there are more stones in the undergrowth. The slabs are made of quartz sandstone with the exception of two granite roofing tables. Only the remains of the central chamber are left, of which there are about 9 pairs of stones, and 2 remaining capstones with a couple more stones fallen in the middle. The entrance is gone so the best guess is that it was in the centre of the passage because similar alignments in the area were built that way. The Allée Couverte de Vauville also known as the (Pierres Pouquelées) Porclay is a term mainly used in Normandy and the Channel Islands. 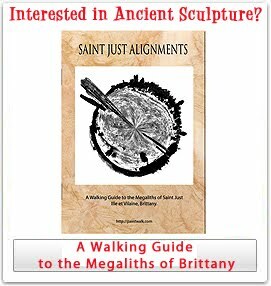 The word "pouquelé" comes from the old Norman " pouque or pocket a word to designate a stone alignment that forms a megalithic monument. The covered walkway was excavated in 1755, before the cap stones were removed, by the Academic Society of Cherbourg. This research was not published. At the beginning of the nineteenth century, the tables were collected by the local inhabitants to build a bridge. The sub-prefect of Valognes learned of this and ordered the restoration. Unfortunately the blocks were simply deposited on the site and the rocks in the undergrowth and those a few meters away were these replaced stones. 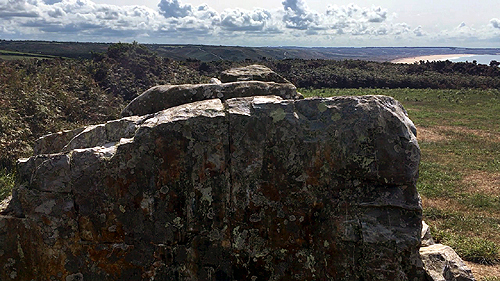 To the south of the Allée de Couverte de Vauville is the Pierre Au Rey which is an unusual tripod megalith that is linked below.